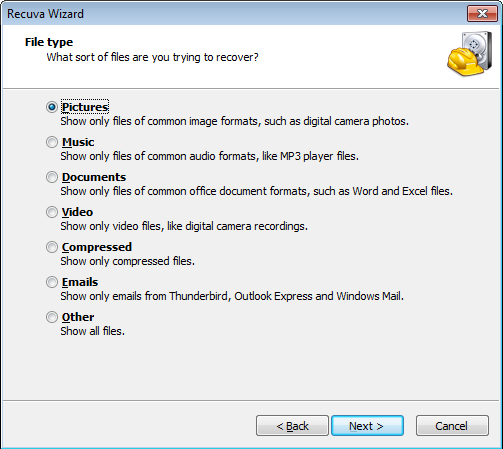 What is Recuva File Recovery Software? Recuva is an important file recovery software used to back up deleted file data information accidentally done by the user from their Windows PC, recycle bin or from an MP3 player. Everyone of us has witnessed the problem of accidentally deleting files containing some useful information from their computer. But what if, that file is permanently deleted from the hardware of the system? You may have come across the situation on your Windows PC where you delete files from your computer, delete all the necessary rubbish from your Recycle Bin and start to wonder did you mistakenly deleted your most important file for your office or personal use? All these questions have one solution – take help from Recuva. Even if you delete a particular file, you can undo the same from your recycle bin, but the actual question is how to recover the deleted files mistakenly being deleted by you from your recycle bin. Don't worry, Recuva specializes in this field. It has an integrated working software which recovers all your data, files, photos, media contents at just a blink of a click. All you need to do is to buy the Recuva recovery software or you can download the free limited period version to check how things work. You will be amazed to know that Recuva will bring back all those files from no where to you to restore it back to your system. What's even more amazing is that, not only it supports your PC, but supportability extension to memory cards, USB flash drives and your iPods are also covered in the software use. What's more Recuva handles special confidential files with utmost care giving you flexible options to delete them from the system forever after you recover the information through it. Using restore and delete function, you can delete files and contents permanently from the system after being recovered through Recuva, so that spammers may not be able to glance through your personal info data. What are the Features of Recuva Recovery software? 1. Restore your word documents with ease : People often get harassed when their entire effort in collecting and researching data written on their Word file goes suddenly no-where especially during the power cuts. While you didn't save your Word document, Recuva restores all the important write ups you had written in your word document previously in last 5 hours of time. Within this intelligent monitoring tool, the software is extremely useful to recover word file write ups especially when it's not being saved. There is another critical situation when Word file crashes out, in such a case you can use Recuva to restore all your data by opening a new word document and publishing previously written contents you marked up in your crashed documents. Overall it works like a security scan which stores and monitors your work all the time and keep updating you when you fall in trouble. 2. Portable and always at your rescue without installing : Recuva's portability has gain a lot of appreciation in recent past for its ease of use without even installing the software. The use is quite simple and something at the need of an emergency on other devices rather than your own device, you can use it with ease without installing on the other device. But in all cases you need to get the software downloaded officially on your Laptop / PC. If your friend faced the problem of deleting his important file accidentally, then he can surely recover that with your help without downloading it officially. If you are in need of hurry to help him out, you can carry your Recuva software on your USB flash drive. 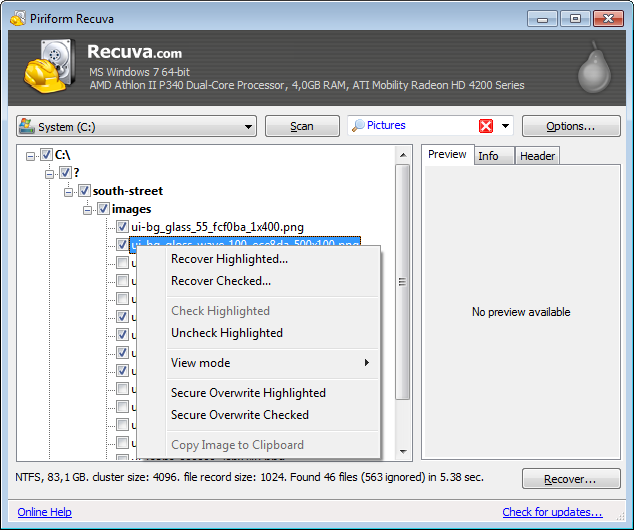 Recuva comes in two version – A portable one and another compressed version. With portable version, you can directly download the .ZIP file for use on multiple occasions on different PCs. For regular version computers, you can still make it portable by first downloading a .EXE file and re-installing the entire version. This way you can make the use of the software with multiple computers and devices helpful for your needy ones. 3. Recover your important emails easily : Now with your fast processor technology of Recuva, you can still be able to recover your deleted emails from your trash bin of your email account. In works in this way – When you use Outlook Express, Windows Live Mail or even Mozilla thunderbird, you have the option to delete the emails permanently from your respective Inbox, send emails and Drafts. In such options, the emails are permanently deleted without storing any type of information; hence you may lose important mails by one accidental click. In such a case, Recuva is helpful in getting back your mail if you have installed the software already or using your friend's one. When you choose the option 'Permanently delete', Recuva comes into picture very quickly. It stores the information of the email before you can actually delete it. It is based on that source of information which was saved prior to deletion of the file, which recovers your data. When you use Recuva to restore back the email, it recovers it in form of .ZIP file format. All your emails will be readily become available to you, which you deleted them through Outlook express. You can now extract the .ZIP file to recover all your emails at once. 4. Extremely quick and efficient in setup : With the moderate setup process in Recuva, you can restore files and information in minutes. All you need is to specify the type of file you are actually looking for, the specific date you deleted them and for more precise finding, mention them the location of your file where it was saved for quick access. You will receive immediate results of your recovery type of files you are looking for in your system. 5. Extremely well supported in all Windows version and multiple language use : Worried about its supportability in different Windows version? Do you believe that Recuva would be difficult to understand in foreign countries? The answer is, you need not to think about all this. Recuva is a well known software supported system used worldwide in over 25 countries having over 2 million downloaded users. Every windows user having its version 2000 or above are eligible to this software without any fuss. It is compatible with all the Service packs and updates of Windows version and makes it comfortable to use even in latest versions like Windows 8. Since many of the users are in Windows 7 club, they can download the file format code exFAT. For Windows 8, it is the same but the reliability is yet to be tested in the newest version. For Linux users, it isn't available yet so the supportability carries only the Windows OS. If you think your friend living in foreign part of world would feel it difficult to understand and use Recuva, then you are wrong. The software supports over 32 local foreign languages making it extremely useful to local people around the parts of the world. 6. Recover even the most difficult files from your system : Well if you aren't sure about Recuva's performance in digging files that you deleted long ago, then that's your wrong idea. The recovery software works on two modes- One quick scan mode and other one, the deep scan mode. Now with the quick scan mode, recover all your files you deleted recently upto your last 7 days of time. All your files you deleted in the past seven days will show up in this category in seconds of time. Normally this mode is more efficient, quick working and people usually receive their result oriented files within this mode of working of the software. But never mind, if you are looking to recover the file you deleted six months ago, or recovery of a file 365 days ago, then Recuva won't disappoint you in any case! It will take few minutes of time to check through the process and scan your computer deep into what sources and types of files were deleted during the space and length of time you specified as an approximate length of time. The system will generate files in .ZIP format, but you will surely get some or the other results. It is actually impossible to source out all the deleted files by the system during the period of time, but approximately 60% success have been recorded with this result. 7. Gain access to all your files from your corrupted discs : Now you can have your access to files from your corrupt discs or discs that have been formatted. Before formatting your disc, if you have forgotten to save keep your files that you require, then you will seriously be under the danger of losing those files. In such cases, Recuva comes into rescue with its method to extract all the files you require from your formatted hard disc. If the index is already corrupt in Windows, you can't get any help from Windows OS, other than Recuva could help you out. Under the damaged or formatted disc, you can search for all the files at a time to locate your important file but chances are really less for a corrupt file to open. In such cases, you can see the probability graph of Recuva to understand better if you can get access to those corrupt files without any hesitation or not. Accordingly take your decision to move forward with the recovery process of any particular file or few files all-together. 8. Delete important files securely after recovering important information : If there are better prospects with the recovery software, then there are prospects of not so good things. Recuva even though provides the best recovery option, but its disadvantage is likely a good medium for all spammers to gain access to deleted files from the system. Any Laptop which has Recuva installed in it, can be used to run recovery programs time and again to gain file access back which was confidential to the original user. If you are in this thought, then you can use security option in the Recuva software to delete those already deleted files completely from the system of software and computer. You can follow the method like this- Delete the file you won't like to use any further from your PC system. Use recover option from Recuva to regain the access of the file you deleted, right click on the file and choose 'Secure Overwrite'. You file in .xls format will be completely wiped off from the memory and software program of the device. Further overwriting from the system memory will delete all history data like cookies, browsing history and all so that not only Recuva, but all other available recovery software tools won't gain or use recovery access to the file you deleted through Recuva. 1. Works on all versions of Windows which includes Windows 2000, Windows XP Professional, XP Home premium, XP Tablet edition and Media Centre version of 64 bit. It works on Windows 2003 and Windows 2008 including all Service Pack versions. It supports best on Windows Vista (Home premium, Office professional) of 64 bit and Windows 7 (All official and updated editions including SP1) at 64 bit. 2. Recuva doesn't work on any Linux platforms and Mac OS X systems. Also since the file required space is too short, the minimum system space requirement also doesn't apply to it. 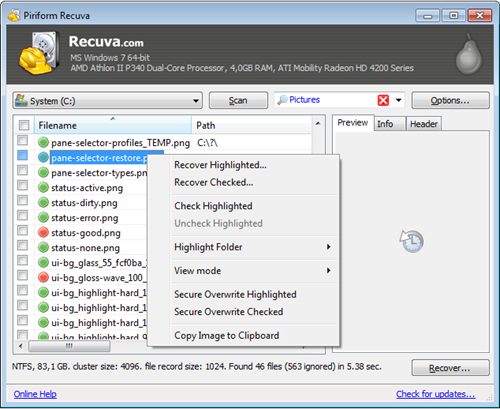 The Recuva recovery process includes a sequence of files that needs to be displayed in order to recover them according to user's needs and wishes. The Windows OS consists of files and folders created from time to time within its system. It allocates a special space in the hard drive as Master File Table (MFT) in which your file's complete information and use are recorded from time to time. When you delete your file from your computer system, the file is actually deleted, but the MFT remains in the hard drive's space. Now if you look to overwrite those MFT, then you can't even recover those files through Recuva. Because of the presence of deleted file's MFT Recuva restores your files as quickly as possible. But certain times, those MFT are replaced with the new files and folders created from time to time. In such a case, those MFT are actually replaced with these new files constantly added to the system to reduce system space. In such a case, it is always recommended to run Recuva as soon as possible when you realise that your file has been accidentally deleted by you to recover it with ease. Here's a basic working of Recuva to actually restore a deleted file. Stage 1: Identify your file and run Recovery process : Try for a Recovery process as soon as you realise that you had mistakenly deleted your important file. If you realise it too late, then you might end up getting on the wrong side receiving absolutely no results for your recovery process. As explained earlier, recovery is carried out by identifying what type of file you are looking for, and whether that's a media based or office purpose containing important word documents stored in them. It all depends on the recovery process involved. Before you lose the MFT of your file take the help of Recuva software to identify them to the earliest. Stage 2: Run the Deep Scan process for in-depth results : If you feel that your normal recovery process to find your files and recovery isn't happening much to your exact file you are looking for, then definitely you should go for the Deep scan process where the entire system is checked twice to locate the file or its snippets. In this process, the Recuva software first catches up the MFT of the file, then uses it to look for the files in the hard disc to match the same. Sometimes MFT of the exact files you are looking for can't be displayed because of the replacement of it with a new file. In order to get the exact file through MFT, it uses the headers which help in getting the nature of the file, type of file, when it was created and so on data. If the data matches with the query of the user, then the file is brought out from the system to show its status whether its fragmented or corrupt. If it's fragmented, then Recuva can play no hand in recovering it to display the contents in the file or data. General Outcome : If you are pleased with both the above scanning methods, and have secured your data through it then its well and fine. The regular scanning technique checks out all the information it receives from the system storage to display them in a list if it finds any relevant information. The second process involves deep scanning which checks each and every relevant file and its sub files for better monitoring. It is always recommended to perform the entire scanning at one go. During normal scanning, if it stops due to any reason, then the results won't be displayed on your screen. On the second case, you can receive relevant information up to the scanning part atleast displaying files that has been matched upon your query. You can select them appropriately, but you can't say whether it would be running normally or has gone corrupt with the data. The status message in this case goes void displaying nothing. Therefore full scanning is necessary to bring out the best possible result during your scanning process. You can use Recuva software to restore deleted files in actually two ways. All you need to do is, to perform the run of the software in any one of the two listed methods for better accurate results. There are two ways of recovery process – One is Wizard mode and another is Active mode. Take an individual look at the working process of both of them to recover all types of files easily through the procedure. In the wizard mode, you can take up the run process to recover all types of files, photos, videos and distinctive types of data. In this process, it involved four types of working modes. An individual guide is provided to each of them. click on Run Wizard option on its homepage. Step 2:	They will display a page which shows – 'Welcome to Recuva Wizard'. Go to Next option along the sidebar. Step 3:	The next junction comes is the type of file to be specified. You can let the software know which type of file you need to recover accordingly. If you seek a picture type file, you may have to choose from .JPG, .PNG, .GIF, .JPEG and .BMP type file extensions. If you are seeking for a music type file, then select from these extensions- .MP3, .WMA, .OGG, .WAV, .M4A. Similarly if you are looking for a document type of a file, use the following extension- .DOC, .XLS, .PPT, .PDF, .XLSX, .PPTX, .ODS and .DOCX. If you feel you lost a video file, then choose from the extension- .AVI, .MPG, .MP4, .FLV, .WMV, and .MOV. If you are unsure about any type you are looking for, then click on 'Skip' option on the Other's toolbar. In this 'Others' option, the recovery tool will check for all the above mentioned type of file extensions in the system. Step 4:	After clicking on 'Others' option, you will be redirected to 'File Location page' where you saved your file last and needs to be checked for further scanning. You can make your software know where did you saved your file by typing- I'm not sure (Recuva will check for all the devices and drives looking for the file not known or known to you), On my media card (Recuva will check all the external storage devices and flash drives which connected to the computer), In Recycle Bin (It will check the recycle bin and will not display any result if the particular file is already present in Recycle Bin, so be careful! ), In particular document (It searches all the files and folders stored in all the drives for better functionality), In specific location (Recuva will look for specific folders or drives as mentioned by you). Then click 'Next'. Step 5:	They will display a Thank You message to you. In this page you choose either to normal scan the file or use deep scanning technique to locate the file in a better way. As explained earlier, choose your options accordingly for better scanning results. Step 6:	Click on 'Start Scan Process'. It starts showing up the scan results of all the files it has looked up during the scan and shows in result page. If you have chosen for Deep scanning, it may take hours to locate your advanced file. Step 7:	If you have received the file that you were looking for, click on 'Recover option' to get your file back. If you haven't received any even with your deep scanning process, then you may have lost it for lifetime from your system. Step 1: Open the Software application of Recuva. In that select- 'Donot show Wizard'. It will disable the wizard process immediately after that. Then start Recuva again by closing and opening the application once more. Step 2: Mention all the details of the files you know as per your knowledge. You can mention the drive in which you want Recuva to perform the scanning operation, mention the type of file you know as per the lost file's specifications. The accepted file extensions available above in the explaination. It will be best if you can mention the file name you know. If you used that file regularly, then you probably would have even known the name of it. It's best to give the information straight to Recuva for recovery process. Step 3: Click on 'Scan' option to start the scanning process. It will display the results of the scan in a particular result window. You can select from the list of files to recover them. You can also recover multiple files by selecting the appropriate option. Select your file destination according to your choice ideally suited to you. Then click 'Ok'.If you don't find any files Recuva searched for, then select Deep Scanning process to set a longer and deeper scan run in the system. Advantages of Recuva : Recuva has loads of features and possibilities that make it look totally different from other photo software recovery tools. Because of its tremendous features, you can recovery files and contents as per your choice or make Recuva do the searching for you. A good lot of options like Deep scanning and normal scanning enables a good way to actually scan through the computer's hard disc and motherboard. Recovering your files through NTFS, FAT and ex-FAT drives has made it easy to work with the Recuva recovery tool. Loads of options like permanently deleting a recovered file from the system and recovering emails has made their flexibility go beyond its normal use. You even have the options of going through the external devices connected to your system by monitoring your flash drives, USB sticks and dongles, memory cards, etc. So a whole lot of features loaded recovery software awaits for you in the coming time. Pitfalls of using Recuva File recovery software : Recovery feature of Recuva is great, but as usual if Windows overwrites the MFT space of the existing deleted file, there is no chance of Recuva to bring back the file to you. If the file found is corrupt according to its use, you cannot even help it out with Recuva or other recovery software. There is a huge risk of spamming since Recuva being already loaded in the system, can generate a recovery process of all the desired files deleted previously to store them as usual in the computer, thereby exposing confidential data of the user. Once you delete a file through Recuva, you can't get it back in any case. This is a very informative article. I've used Recuva to restore some of my deleted files and it did pretty well. Above all the best thing I find about Recuva is that it is very easy to handle because of its user-friendly GUI. Thanks for dropping by. Yes I have been using Recuva for recovery option too. It's pretty friendly as per the operating system and user interface. Even the working module is very easy and recovery success is more than 80%.